The White Heron, ideally located just 15minutes from Ubud Central, is surrounded by rice fields and natural forests. It is a representation of the 'true Bali'. With 2 bedrooms, 2 bathrooms, large garden and an azure pool, you will find your home away from home here. Our housekeeper will clean the villa daily (Monday to Saturday), at a time that suits you best. Ubud is the place you want to visit to experience the more village and traditional feel of Bali. A lot of rice fields, traditional homes (the White Heron Villa is one of them! ), and temples you can visit and join the experience. Ubud also host the famous Monkey Forest where protected monkeys live at the forest temple. You will conveniently stay just 15 minutes by car to Ubud central, which is also where Ubud Palace is. The main street has a lot of gift shops, restaurants, cafes, traditional markets to satisfy even the most discerning customers. In your free time, take a ride to the north side and visit spectacular rice paddy of Tegalalang or even go further north to visit Water Temple at Bedugul. Bali Bird Park, Bali Zoo and other attractions are also only short drive away. The options are limitless. We can also recommend you a list of our personal favorite restaurants, cafes & spas nearby. Please note that if you are visiting a temple you will need to wear appropriate clothing (Women must wear a long sleeved shirt or dress, a sash or scarf around your waist, and a long skirt to cover your legs. Do not go into a temple whilst menstruating. Men must wear long pants and a shirt which covers your shoulders. Everyone must wear something on their feet). Please do not take photographs inside a temple without permission and certainly not when a ceremony is underway. During your stay in Ubud, you will find a lot of artistic creations from wood carving, jewellery making, to batik material workshops and landscape painters. We can provide a list of local artisans and cooking schools so that you can book into a class, if interested. Ubud and its hills and ravines are famous with adventurers. You can mountain bike, whitewater rafting, river tubing etc while staying in the area. I consider myself a global citizen, having travelled to more than 80 countries. This villa is my own home, which I will occupy when I retire. 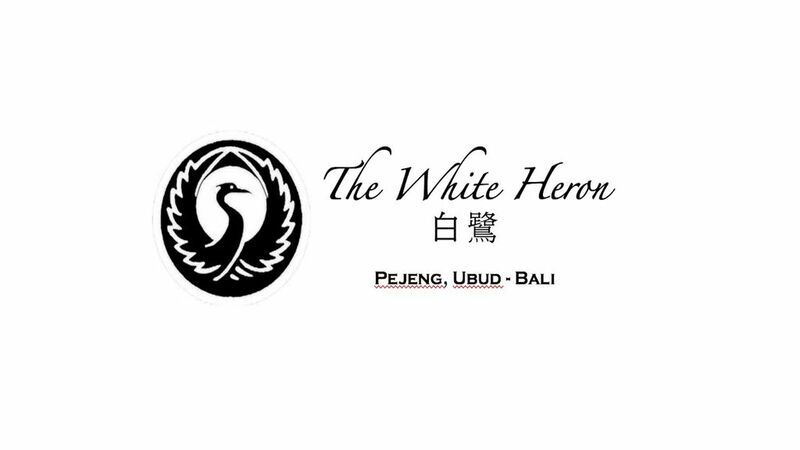 The White Heron allows you to stay in the true Bali. The area is quiet tranquil, the villa is tastefully decorated, featuring four-poster beds in the room and Javanese antiques. The spacous stone terrace, infinity pool, traditional thatched gazebo, sunbeds, and daybeds ensure optimal relaxations. The in-house staff is made up of a couple, Made and Wayan, who look after the villa (cleaning & laundry), as well as pool & garden. Delicious breakfast (and other meals) can be arranged directly with Wayan for a small fee to cover her shopping for ingredients. Airport transfers can be arranged on request. It takes about 1-1.5 hours each way from the airport, and costs IDR 400,000 (about $30 USD). You pay direct to the driver Housekeeping and Laundry Our housekeeper will clean the villa daily (Monday to Saturday), at a time that suits you best. About Ubud, Bali Ubud is the place you want to visit to experience the more village and traditional feel of Bali. A lot of rice fields, traditional homes (the White Heron Villa is one of them! ), and temples you can visit and join the experience. Ubud also host the famous Monkey Forest where protected monkeys live at the forest temple. You will conveniently stay just 15 minutes by car to Ubud central, which is also where Ubud Palace is. The main street has a lot of gift shops, restaurants, cafes, traditional markets to satisfy even the most discerning customers. In your free time, take a ride to the north side and visit spectacular rice paddy of Tegalalang or even go further north to visit Water Temple at Bedugul. Bali Bird Park, Bali Zoo and other attractions are also only short drive away. The options are limitless. We can also recommend you a list of our personal favorite restaurants, cafes & spas nearby.